Description: A Must See! 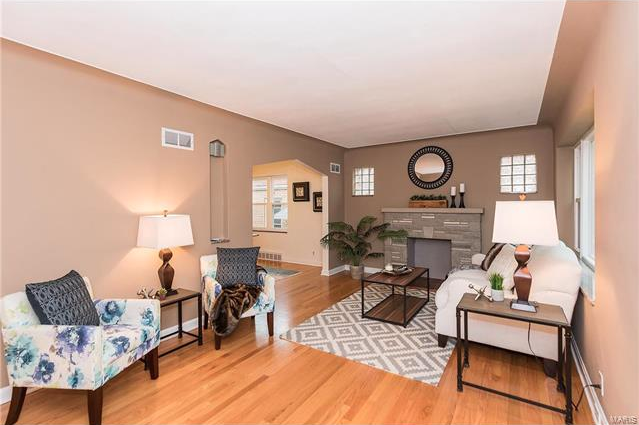 2 story Brick charming home located in the well sought-out neighborhood of St. Louis Hills. Near Francis Park, walking distance to legendary Ted Drewes Custard Shoppe, and other unique shoppes and restaurants. This Pristine home is move in ready. Hardwood floors, stained glass windows throughout most of the home. Kitchen is updated with Custom Cabinets, Granite countertops, Island w/warmer, stainless steal appliances. Refrigerator stays. 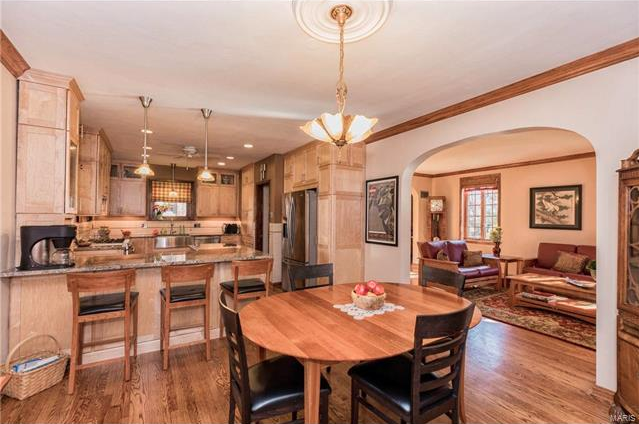 Kitchen/Breakfast room is adorned w/ Stained Glass windows and arched entry ways. Off the kitchen a room for an office, playroom, or relaxing. Living room is spacious, w/ one of the two vent-less gas fireplaces. Upstairs, Master suite w/ “newer” added sitting area, a masterbath ,walkin closet. Lower level Full Bath, Vent-less fireplace, walkout basement perfect for a 4th Bedroom. Outdoor covered patio w/ fan. Propane grill stays. 2 car Garage, w/ 220 outlet for appliance or electric car. Roof contains Solar panels. Description: Just under 3,000 sq ft one of a kind home can be all yours!Everything has been updated and restored!Right when you walk in you will be amazed by the beautiful 3 story staircases orig. to the home-1890!The kitchen is beautiful- natural stone counter tops, center island, stainless steel appliances, and a wine cooler!It opens to an dining/sitting area perfect for entertaining! Enjoy the deck right off the kitchen that overlooks your privacy fenced yard with 2-car port.You will love the high ceilings, and the huge windows throughout!The fireplaces and exposed brick add so much character and charm to the home. 2nd-floor master is stunning!Huge walk in closet with custom built ins, master suite with elegant bath, custom shower, double sinks, and jacuzzi tub!There is another bedroom, bath and laundry room with a beautiful slider barn door. Third floor is perfect for guests, with a family room, full bath, and bedroom. Newer roof with warranty, new custom blinds throughout.Tax abated until 2020! Description: You belong in this beautifully renovated brick gingerbread house. Imagine lighting the huge, front evergreen tree for Christmas in your new home! 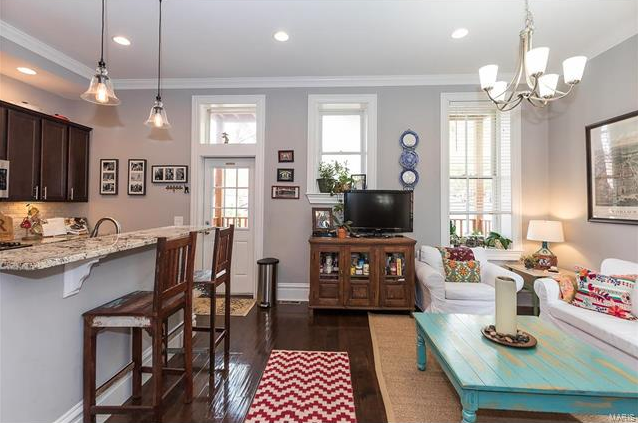 Recent, major renovations combine old charm with a fresh look that’s move in ready. The new kitchen features soft close custom cabinetry, quartz counters, tons of cabinets and a pantry. All new stainless steel appliances: high-end gas range, built-in microwave, dishwasher, disposal and refrigerator. Updated bathroom with new vanity, toilet, re-glazed tub and tile, and laundry chute. Newly refinished hardwood floors, fresh paint, large living room and dining room, both with cove ceilings. New roof in 2014 with 25 year architectural shingles. Cozy thermal windows and some glass block. Of two upper level bedrooms, the larger one has 2 walk in closets, and built-in cabinets. There’s plenty of space upstairs to add a bathroom for a large master suite. Home warranty included. WELCOME HOME!